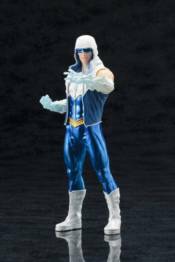 Kotobukiya bring's more villains from DC Comics to their ARTFX+ 1/10 scale statue lineup with Captain Cold! Highly detailed sculpt includes two different arm pieces, allowing for display with either his cold gun or ice-covered arms. Leonard Snart wears his hooded blue and white vest and cold weather goggles, stepping straight from the pages of DC Comics! Display alone or alongside other Kotobukiya ARTFX+ statues like The Flash!